Love is always in the air in St. Augustine! From our serene beaches to our quiet historic district, there’s no part of the Nation’s Oldest City that doesn’t spark romance. 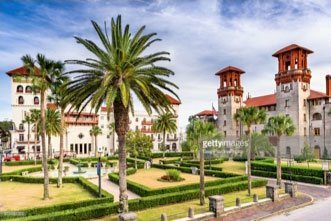 While there are plenty of great things to do in St. Augustine for couples, there is one activity that’s near and dear to the hearts of all the locals. If you’re planning on visiting our beautiful town to celebrate your honeymoon, an anniversary, or just for a quick romantic getaway, make sure you pay a visit to one of the seven St. Augustine love trees. 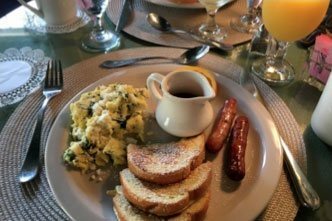 Before you begin your search for the St. Augustine love trees, make sure you fuel up! Access our free Vacation Guide suggestions for great restaurants in the area. Whether you’d prefer a pastry at a Spanish cafe or a romantic dinner for two at a gourmet restaurant, we have plenty of recommendations! Ask five different St. Augustine residents about the love trees and you might get five different answers. Some may say they’re lovers caught in an eternal embrace while others will say they cast a spell to keep lovers together. Others will simply say they’re two trees that have grown together over centuries. Regardless of their origins, the tree symbolizes the love and commitment that comes with a relationship. The legend of the trees states that if you kiss beneath one of the trees, you and your partner will enjoy everlasting love. No one really knows how many love trees there are in St. Augustine. At least seven have been found in the city, mainly in our downtown district. Simply St. Augustine has the most complete list of love trees in the city, complete with pictures and directions on how to find them. This is a great resource to use if you’d like to go directly to one of the trees. Many visitors prefer to hunt for them without help, finding the journey to the trees as much fun as the kiss underneath them. 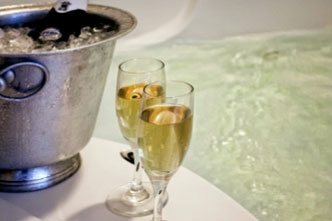 The perfect complement to a romantic day searching for love trees is an evening at Agustin Inn. Our historic bed and breakfast serves as the perfect backdrop for a night of romance. Include one of our romantic packages in your reservation for the full St. Augustine experience. Our Agustin Classic Romance Package includes a private horse and carriage ride from the Inn (ask your driver to take you by a St. Augustine love tree as a bonus), a half-dozen assorted roses and half-dozen chocolate-covered strawberries waiting for you in your room, and a gift certificate to one of St. Augustine’s signature restaurants. We also offer the Ultimate Romance Package. This includes a private horse and carriage ride, a half-dozen chocolate-covered strawberries, complimentary champagne on ice, a dozen assorted roses, and a flameless candle. This is perfect for a honeymooning couple! One of our most romantic rooms is the Camelot Suite. It’s perfect for couples on a romantic getaway. 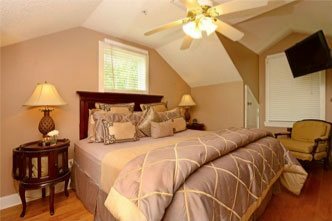 The suite is located on the second floor and features a King-sized bed and a brand new Jacuzzi/shower combo. It also boasts a large private balcony that overlooks shops on Cuna Street. The mini fridge found in the room is perfect for keeping chocolate-covered strawberries cool or for chilling off a bottle of wine or champagne. Whichever room or package you decide to reserve, you’re bound to have an unforgettable night at Agustin Inn. Browse the rest of our guestrooms and book your room today! We look forward to having you.